In Week Three, each student in their library class was given a light bulb to draw a book that has lit up their life. A book that has made them happy or sad or moved them in some way, or a book that has taken them on an adventure, made them think or taught them something. By the end of the week after 21 classes we had 468 light bulbs! (Students who were absent will have a chance to add their light bulb too so hopefully we will have approximately 530 book light bulbs around our library). I had hoped to put all of the light bulbs together to create one large light bulb BUT we had a few too many light bulbs for that idea! So lots of light bulbs are also displayed around our library ‘lighting’ it up with books. It has been wonderful to see students excitedly searching for their light bulb, looking at the books other students have drawn or seeing who else likes their book. On Friday our fireflies reading books were added to our display and each one has a message about books. Can you find your book light bulb on our slideshow? Which book did you choose for your light bulb? This entry was posted in Uncategorized and tagged Book Week, Books, Library displays, Reading by smotlrcblog. Bookmark the permalink. I was sick so I didn’t get to do a light bulb but if I did I would do Harry Potter! Ps. I have been working on my project for book week and I hope you like it. There were quite a few people away that week, but don’t fear! If you come and see me I’ll give you a light bulb to do at home and then I’ll put it up with all of the others. What a great idea! Your display looks fabulous. Well done! Thank you for visiting our blog and leaving such a lovely comment. It has been fun involving every one in our Book Week display. 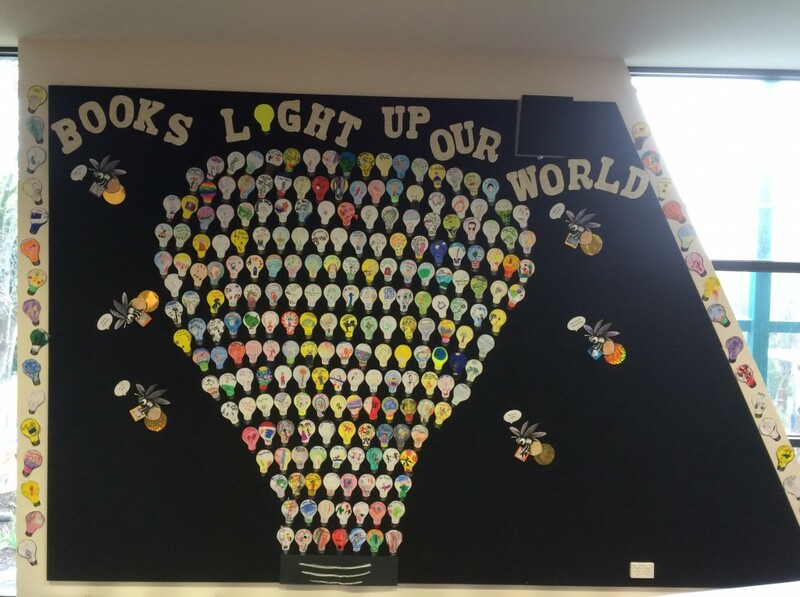 This week we’ll add more book light bulbs around our library as students who were absent will be making theirs too. You always have the most amazing library displays. This is another one that ‘lights me up’! If I was going to add a light bulb, it would say The One and Only Ivan by Katherine Applegate. That book took me down a path I never ever expected. Lovely to hear from you Mrs Hembree! I hope you are relaxing and enjoying sharing your amazing trip to South Africa with your family and friends. I have always been very lucky to have my very talented library technician Mrs Collins to do our fabulous library displays. However, this year it was up to ME! I decided that I would like our students to be part of creating our display and this fabulous book light bulb is the result. It is lighting up our library with books along with all lots of other light bulbs around our library. I love your lightbulb idea! How gorgeous. Tell your children that their lightbulbs light up my heart. Have fun in Book Week! Thank you for your lovely comment Tania, I will pass it on to our students. We love that our big light bulb and other lightbulbs are lighting up our library with books that we love to read. Have a fun Book Week in your library too!